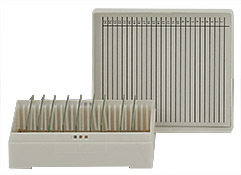 The sturdy Micro-Tec slide mailers are made from natural polyethylene and have a capacity of 1 or 5 standard 75 x 25mm or 3” x 1” microscope slides. They close with a snap-in lid. Ideal for shipping, storing and handling. 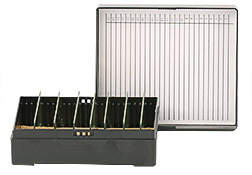 The Micro-Tec M5 can also be used as a disposable staining container. The plastic Micro-Tec microscope slide storage boxes are available for the standard 75 x 25mm (3” x 1”) and larger 75 x 50mm (3” x 2”) microscope slides. Storage capacity for 25 slides or 100 slides in various colours. 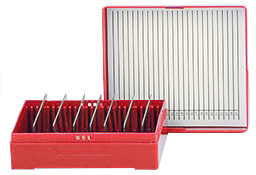 The storage box for 100 slides has a hinged lid and a metal clasp. They are made from polystyrene with a cork sheet in the base and a slide storage card in the top. 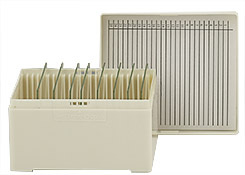 The slide storage boxes contain ridges and grooves to make them stackable. 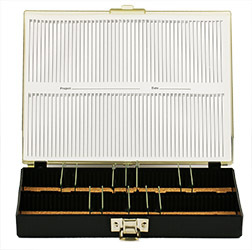 The black microscope slide storage box is recommended for light sensitive specimens .